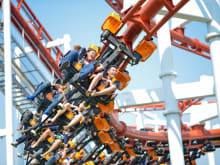 Located just on the outskirts of Bangkok, Dream World is Thailand's Premier Theme Park. With thrilling coasters, boat rides and several areas for families to enjoy and relax, this is a great one day trip from Bangkok! Dream world Bangkok is quite fun filled and enchanting place. I visited with complete family (parents, wife and infant daughter). We all enjoyed equally.All Rides were very enjoyable. I liked black hole and tornado the most. Some activities eg: animal show, were average for an adult but quite exciting for kids. Overall dream world is a nice getaway for weekends but ideal for kids only. At some places adults might feel a little less satisfied. I booked the ticket to be entered to Dream World on the next day. It is very efficient and I get the tickets confirmation within 30 minutes. Disadvantage was it take times for the information counter to issue official ticket which required to show them all my booking info. Seamless booking and no printing required. It was really quick, so I enjoyed the rest of my day. Ticket counter people took about 3min to find my booking. Tickets issued. No questions asked.